Flip Out Mama: Keepin' It Clean with Dust-Off! We have such a problem keeping things clean around here, and our electronics are no different! It doesn't seem to matter what it is, messy is just how we roll. Our computer and tv screens are a mess, our keyboards are filled with dust and crumbs, ugh! It is just never ending! Luckily, I have found a product that I think will really help us keep our electronics clean(er)! We received a wide variety of products from Dust-Off. 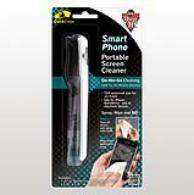 Their company makes tons of safe cleaners for your electronic devices. The Kit includes: 1 – 50ml Screen Spray, 1 – Screen Shammy for use on various devices, 1 – Plasma Screen Cloth, 1 – CD/DVD Cloth for media disks, 1 – Sweep mobile cleaning pad. All components are packaged in a zippered Storage case so you can keep everything handy in one place!! This is a really great kit! My hubby has really enjoyed cleaning everything with this! 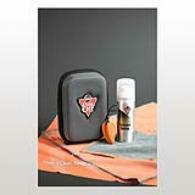 I find myself reaching for this kit quite often when I see smudges or dirt on something! I could really tell a difference as soon as I used it! I also really liked the fact that the spray did not drip and run down my computer screen. That was an added bonus! 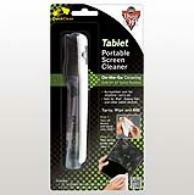 We were also lucky enough to receive a Smart Phone Portable Screen Cleaner and a Tablet Portable Screen Cleaner. These have both come in really handy! I gave the Tablet Cleaner to my nephew, and he says he has been using it all the time, and we put the Smart Phone Screen Cleaner in our glovebox, since both of our phones seem to be disgusting when we get off of work! We really enjoyed trying these cleaners from Dust-Off! I really enjoy having an easy way to clean at least one thing around here! I recommend that everyone go here and check out Dust-Off's site, they have some really great products! They actually have a line of Gamer Cleaning products that you know my hubs is dying to try out! Disclosure: I was provided with a sample product in order to conduct this review. Although a sample product was received, no monetary compensation was received, and all opinions are my own.